A copyright information page will generally include more than just copyright information. Publication information, disclaimers, and design accreditation also appear on this page. Note that I’m not a lawyer, and am not providing legal advice. Where should the copyright information page go? For a print book, this page should go in the front matter at the beginning of the book. I put mine after the title page, which is what’s most commonly done, but it doesn’t have to go in that exact spot – and of course what’s in the front matter will vary by book, publisher, and author. Look through print books that you consider well-formatted for examples. 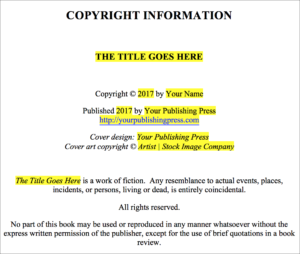 Note that the copyright information page always appears on the left page in a print book. For an ebook, this page can go in the front matter, but it’s more commonly put in the back matter, at the end of the book. If your book is available on a website that allows readers to see a preview, placing the copyright page in the front means there’s one less page available for the preview. And while you can and should care about this page, it’s highly likely that your readers won’t. NOLO’s The Copyright Handbook lists specific requirements for where in a book the copyright notice may be located. Note that the order in which these elements occur can vary. I suggest you look at other ebooks to decide how you’d like your page to look. This isn’t required, but some authors list their name under the title. I don’t include this in my books. This isn’t required, but it’s good practice to note the edition if it’s not the first edition. There’s some question as to whether or not this is necessary, but I put one in just to be safe. Refer to a resource like NOLO’s The Copyright Handbook for more information on the various format options and legal requirements. I’ve read that this is not required, but I include this text – partly because almost everyone still uses it, and that way my copyright page looks like a standard page. There is no one right way to word this text – I looked through examples in other books, and based on that came up with something I now use in each of my books. This is your publishing press name and URL. You can also include a mailing address and/or other contact information. If you don’t have a publishing press, list yourself as the publisher. If you have an ISBN, it should be listed on this page. This isn’t required, but is often done in print books. How do you make sure to do this in each book? I have templates that I use when formatting my books – one for print and one for ebook. On the copyright information page, the pieces I need to update, or at least review (like the copyright year) are highlighted so that I know exactly what I need to look at for each book. I occasionally tweak my template, but even when I do, just having it already set up means I don’t have to remember all of these details every time. Do you really need a copyright information page? Not being a lawyer 🙂 I can’t say if you need one or not – but there’s no reason I can think of to not include one. Plus there’s a lot of information on these pages in addition to the copyright notice. For example, if you’re licensing someone else’s artwork for your cover, you’ve probably signed an agreement that requires you to acknowledge the source of the imagery. These pages are also very standard in the industry, and not having one will look odd. Copyright notices, as opposed to pages, are not required for works published after March 1, 1989, but there are a number of very good reasons to add them anyway. If you’d like to learn more, or have specific questions about what is/is not technically correct, please refer to NOLO’s The Copyright Handbook, or one of the many other great resources available.